: hand–held tester only: narrowing down the trouble area is possible by performing ”a/f control” active test (heated oxygen sensor or other trouble areas can be distinguished). perform active test using hand–held tester (a/f control). : ”a/f control” is the active test which changes the injection volume to –12.5 % Or +25 %. Connect the hand–held tester to the dlc3 on the vehicle. Warm up the engine by running the engine speed at 2,500 rpm for approximately 90 seconds. Select the item ”diagnosis / enhanced obd ii / active test / a/f control”. Perform ”a/f control” with the engine in an idle condition (press the right or left button). : there is a delay of few seconds in the sensor 1 (front sensor) output, and there is about 20 seconds delay at maximum in the sensor 2 (rear sensor). 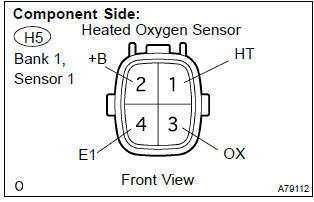 The following of a/f control procedure enables the technician to check and graph the voltage outputs of both the heated oxygen sensors. For displaying the graph indication, enter ”active test / a/f control / user data”, then select ”o2s b1s1 and o2s b1s2” by pressing ”yes” button and push ”enter” button before pressing ”f4” button. : if the vehicle is short of fuel, the air–fuel ratio becomes lean and heated oxygen sensor dtcs will be recorded, and the mil then comes on. if different dtcs related to different systems that have terminal e2 as the ground terminal are output simultaneously, terminal e2 may be open. A high heated oxygen sensor (sensor 1) voltage (0.5 V or more) could be caused by a rich air fuel mixture. Check for conditions that would cause the engine to run rich. A low heated oxygen sensor (sensor 1) voltage (0.4 V or less) could be caused by a lean air fuel mixture. Check for conditions that would cause the engine to run lean. turn the ignition switch on and push the hand–held tester or the obd ii scan tool main switch on. select the item ”diagnosis / enhanced obd ii / dtc info / current codes”. : if any other codes besides p0130, p2195 and/or p2196 are output, perform the troubleshooting for those dtcs first. start the engine and push the hand–held tester or the obd ii scan tool main switch on. select the item ”diagnosis / enhanced obd ii / data list / all / o2s b1s1”. warm up the heated oxygen sensor with the engine speed at 2,500 rpm for approximately 90 seconds. read the output voltage of the heated oxygen sensor during idling. alternates repeatedly between less than 0.4 V and more than 0.5 V (see the following table). Disconnect the h5 heated oxygen sensor connector. 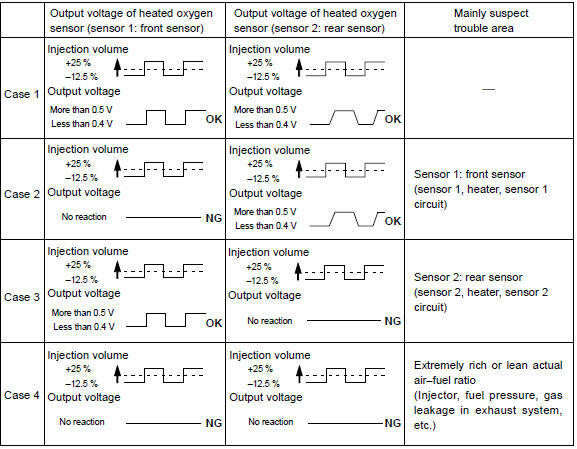 measure the resistance between the terminals of the heated oxygen sensor connector. Reconnect the heated oxygen sensor connector. 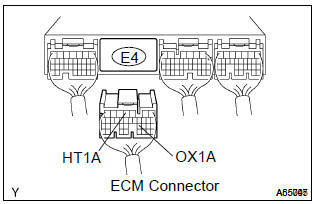 check for continuity in the efi relay. Check the air induction system for vacuum leaks. Check the fuel pressure (high or low pressure). : clear all dtcs prior to performing the confirmation driving pattern. 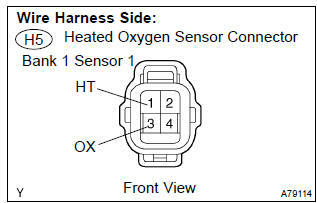 read the dtc using the hand–held tester or the obd ii scan tool.